Many people who have vision loss due to macular degeneration often spend their energy seeking the latest treatment or technology to enhance their vision and while this is noble and often helpful, it is also important to realize that there is another avenue to maximize one's usable vision. It is color and contrast. It wasn't unusual for my father-in-law who has wet macular degeneration to knock over his drinking glass. Because it was made of clear glass and filled with clear water, the glass became "invisible" to him. By simply replacing the clear glass with a dark blue, solid color one he is now able to see it on the white countertop. There are less mishaps in the kitchen. Another example of how color and contrast can make a big difference in the kichen is with this black and white cutting board. 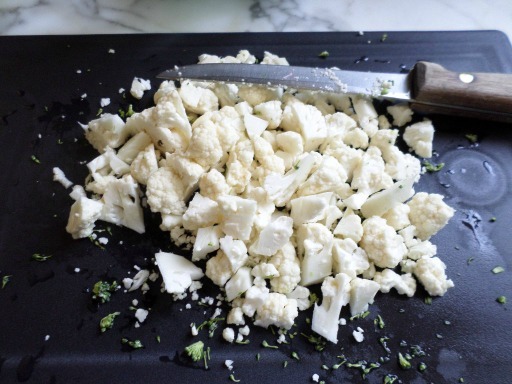 Cutting up white cauliflower on a white board can be very difficult to see while if you use the black side of the board the white cauliflower suddenly becomes quite visible. Find out other ways that color and contrast can make your usable vision more "usable:"